The Block Set Pro (formerly the Knot Finder Kit) includes one each Small, Medium and Large Blocks. These tools are designed to release muscles that are not in close proximity to the spine and can be used on nearly any part of the body for Trigger Point Therapy and Joint Mobilization. 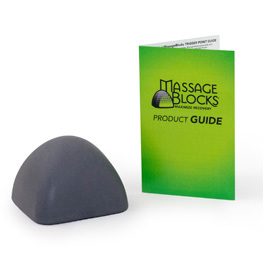 Massage Blocks stable platform outperforms any massage ball on the market, your satisfaction is guaranteed! Runners - this set is also great for plantar fasciitis and stretching of the mid-foot and ankle. This purchase includes the Large, Medium and Small Knot Finders.